mama elephant | design blog: Stamp Highlight: Around We Go! Stamp Highlight: Around We Go! Happy Monday! Today kicks off our Stamp Highlight series, where we feature/highlight a new stamp set everyday. Our Design Team is incredibly talented and versatile, it's always so much fun seeing all the different projects they come up with using the same stamp set! 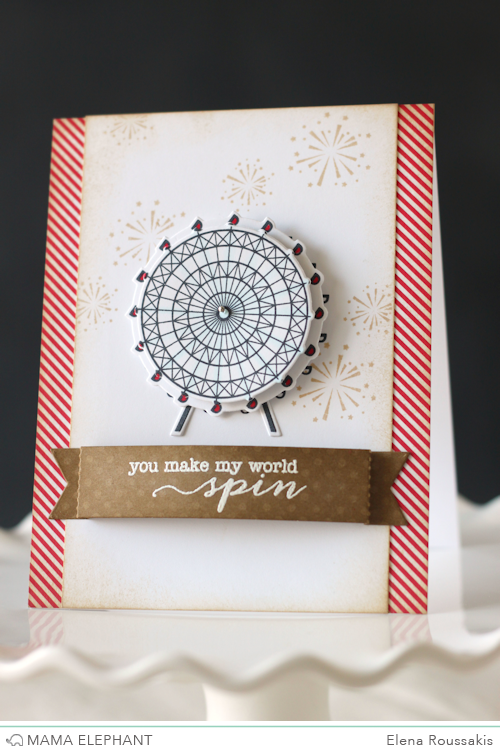 Let's start off with Around We Go which also has a coordinating Creative Cuts set! Just a super fun, fun set with so many possibilities! Laura created a fun carnival scene with colorful seats on the Ferris wheel, bright hot air balloons and rolling hills. Elena's card is fun! With a ferris wheel that actually spins, how could it be anything but? For her card, JJ shows the versatility of the stamps in Around We Go. She used the stamps to create a colorful graphic background! Don't you just love all the yummy Mama Elephant ink colors? 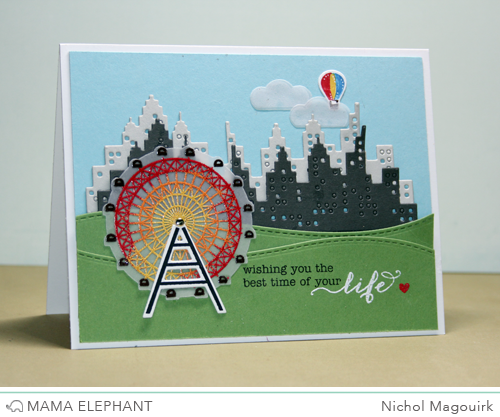 Nichol created a carnival scene outside "the big city" by placing the stamped and die cut ferris wheel from Around We Go in front and tucking layered die cut Cityscapes behind the rolling "hills" die cut using the Landscape Trio dies. 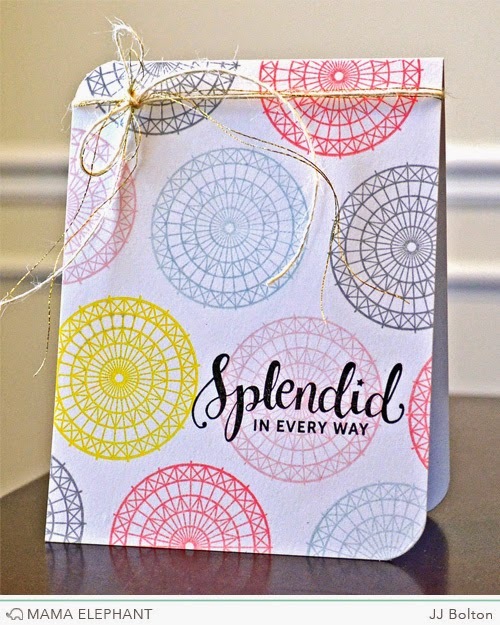 A stamped greeting in multiple colors adds to the playful feeling. Emily created a multi-layered scene with a colorful and sparkly ferris wheel as the focal point. Femme Frames and Landscape Trio Creative Cuts were also used to complete the scene. This card is sure to brighten someone's day. Those cards are all really amazing. They really show off how versatile that stamp set can be! Oh my gorgeous-ness! You have quite a talented group of DT's Mama! I love these cards and this stamp set!! Hello spinning ferris wheel!! And I love how colorful and fun all the projects are! Your Design Team really is super talented!!! Great cards. I love the ferris wheel without the legs. Makes a very lacy card and the different colors really make them pop. The little hot air balloon in several cards is cute. These are such cute and fun cards! absolutely stunning cards here! wow!! i seriously want to skirt all of my responsiblities so i can create right now! i'm so inspired! This set is so FUN, as evidenced by the DT's terrific cards. I love this new stamp set, is amazing! I love all of the cards. My products arrive Saturday. Yayyyy!! Very fun cards..this set is filled with such happy images and sentiments. Such a fun set! Super cute cards! Fun and fabulous cards!!! The spinning ferris wheel is AMAZING! I already made a purchase from this release but didn't get this set. DARN! Oh well, life is full of regrets. I'll have to place another order, but I think I'll wait out this week. What stunning creations. The more I see this set the more I like it. What a fun set can be used in so many ways as the DT has proven great variety of cards love them all! Ooh I love what the ladies did with this set! Awesome job! Great stamp set & cards. Love the ferris wheel! Thanks for a chance to win. LOVE that you can use the elements of the Ferris Wheel too - so clever of JJ to make the background!!! I can see the base of it becoming a little ladder or train track too!!! THANK YOU for the inspiration and temptation!! !